But until then, one of the most prevalent externalizations of the fast was my desire to incorporate more nutrient dense recipes into the whole family’s foodie experience in a way that Captain, with a devil-may-care-never-gain-a pound-in 12-years attitude about food, and the now 3-year old East Side Plinkas would appreciate and perhaps not even notice… could it be done? This first amazing dinner (recipe to follow) actually received a “Woah” upon first bite from Captain, and the true test of YUM… a complete silence that fell over the table as everyone was eating. This will be a new Castle of Chaos regular. Preparation: Soak beans overnight or for a minimum of 10 hours, boil until soft, drain and let cool to warm. If using canned beans, just drain and rinse. In a separate pan, boil quinoa and diced beet root together in 3/4C water (or mushroom broth is nice!) for 15 minutes, remove from heat and allow to cool to warm. There should not be any extra liquid, but if there is, drain it off. Mash the beans, making sure that there are no whole bean pieces left (whole beans will cause your patties to crumble). Add the beetroot and quinoa mixture. Stir in all other ingredients – onion, garlic, cilantro, tomato paste, spices. Salt and pepper to taste. 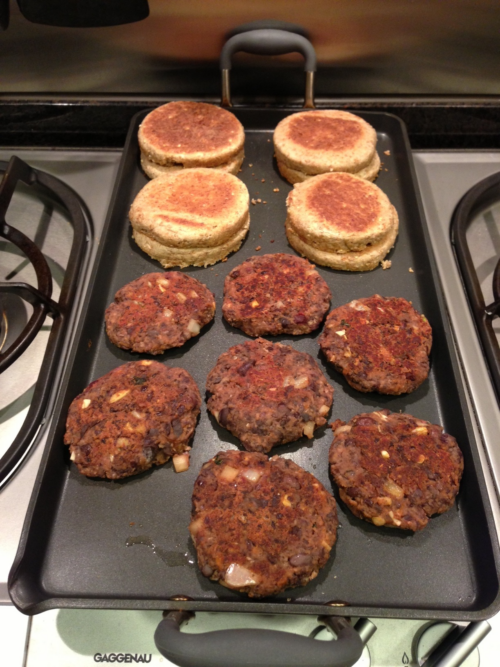 Form patties and cook over medium heat in a non-stick pan. Use a sparing amount of coconut oil to prevent sticking and form a nice crust on the surface. Makes 8-10 burgers. 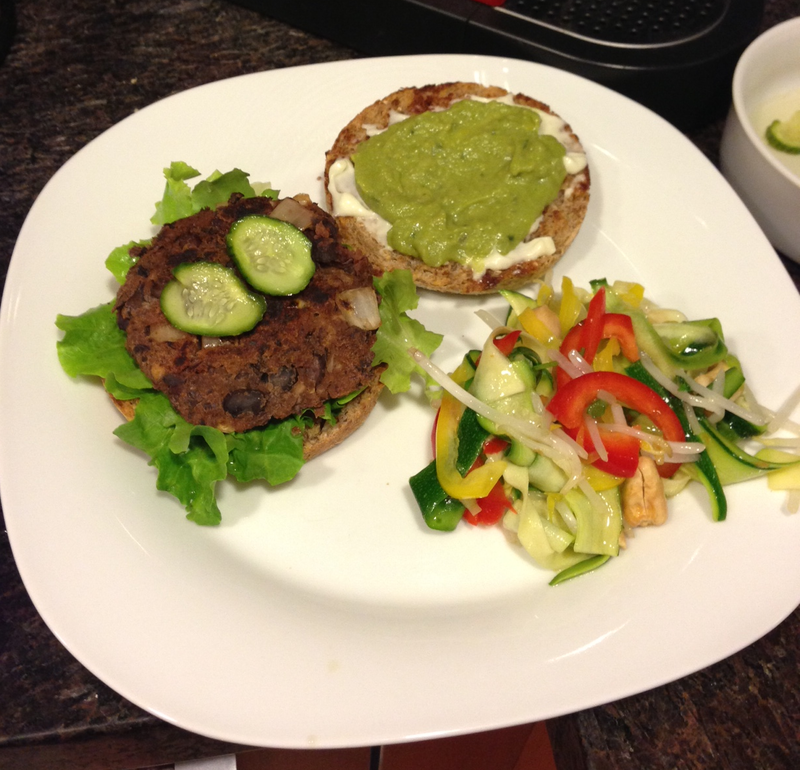 Dress and assemble your burger: we like Ezekiel sprouted grain English Muffins, avocado or guacamole, ketchup, lettuce, tomato, pickles… whatever you would put on a regular burger. I do like to make my own pickles: slice organic cucumber and soak for 2 hours in Cou-Sushi vinegar. So crisp, fresh, and yummy. Note: this salad does not actually contain Pad Thai noodles – it is a completely raw veggie preparation. Preparation: using a vegetable peeler, slice the zucchinis into long, ultra-thin, noodle-like strips. Add bean sprouts, breaking them into manageable pieces as you go (I break them 3 or 4 times). Add red and yellow bell peppers, and green onion. Pour the juice of 1 lime over the salad and add the sweet Thai chili sauce as you stir, holding back on the sauce so it isn’t too soupy. Toss and serve, topping with cashews as you plate. (If the cashews are added early, they will get soggy and lose flavor). This salad is delicious served immediately, but also keeps for up to 3 days in the fridge, so we just keep pulling it out for sides and snacks until it is gone. Note: after the salad starts to “settle”, it does develop a “juice”, so serve with tongs… don’t just pour it out on a plate! I was curious about the calorie count of the burgers… if the mix makes 8 large patties, then each pattie is about 93 calories, plus the 160 calorie bun, plus condiments. If you pair this with a raw salad (like this one) you get really full for well under 500 calories, with nominal, healthy fats (coconut oil and avocado), tons of micro-nutrients, nice complex carbs, and a healthy dose of fiber.